"Great Pricing, Support, and Logistics. whether its Internationally or Domestic." Sr. Director, Global IT Infrastructure & Telecom, PerkinElmer Inc.
Liebert GXT3 5 kVA to 10 kVA uninterruptible power supply (UPS) systems provide true on-line protection in the smallest cabinets in their capacity range. 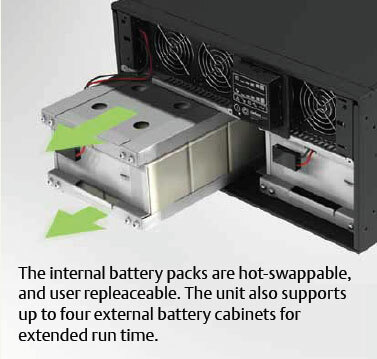 These data center power systems offer internal batteries, unlimited extended external batteries, and internal bypass capability, resulting in continuous uptime for the connected equipment. Multiple data center power output configurations allow quick connection of protected loads. Designed for rack-mount or tower modes, the Liebert GXT3 uninterruptible power system is available in 5kVA and 6kVA, 4U models; and 8kVA and 10kVA, 6U models. All models are available with output of 120/208V. Please note that the internal batteries for the Liebert GXT3 5kVa to 10kVA UPS must be ordered separately, and will ship separately. Depending upon the model you select, there may also be a separate POD required.